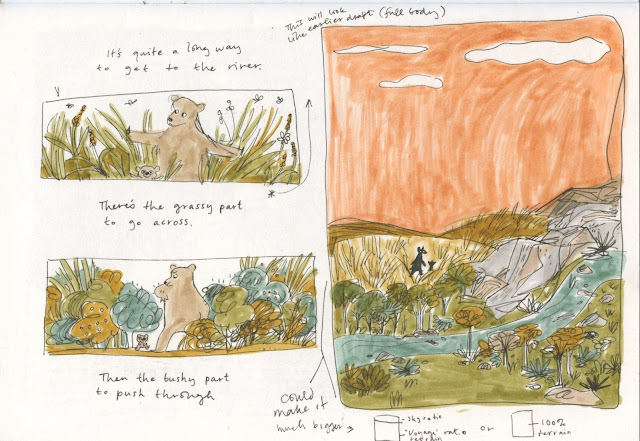 The dream team behind our Book of the Month, A Brave Bear, tell us how they went about creating the book. Sean Taylor has written more than 40 books for children, including Hoot Owl and Where the Bugaboo Lives. Find Sean online at www.seantaylorstories.com and on Twitter as @seantstories. 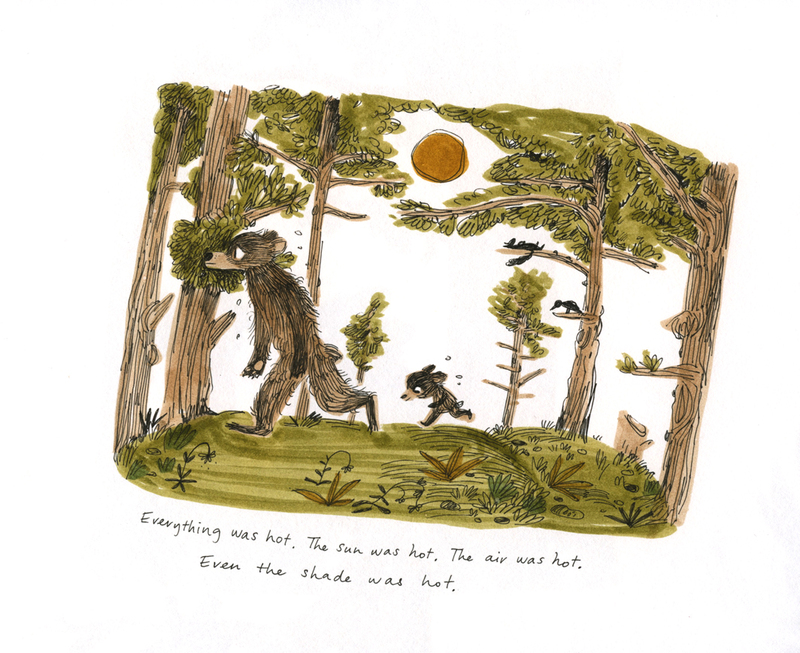 Emily Hughes is a talented young illustrator whose first picture book, Wild, was met to great acclaim. Emily is quickly becoming renowned for the enchanting, atmospheric worlds she draws. Find Emily online at e-hug.blogspot.co.uk and on Twitter @plaidemily. 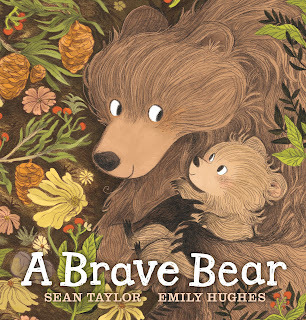 A Brave Bear is 288 words long. That’s one of the shortest stories I’ve written. 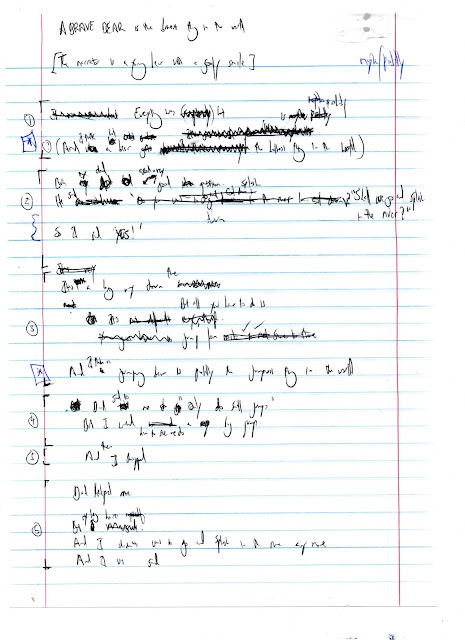 And it won’t take very many words to explain how I wrote it. 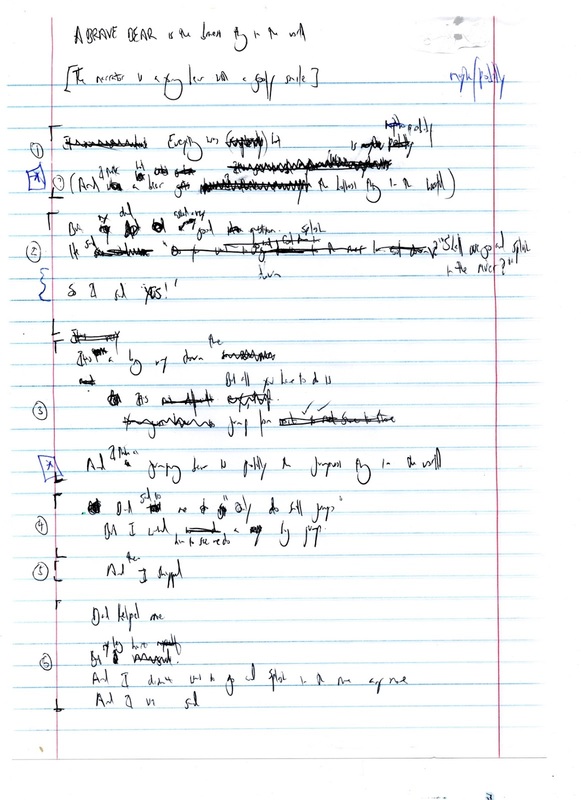 My starting point for a story is often some scribbling on a piece of paper. You may need some help to make some sense of that! These phrases, which went on to become the basis for the story, always had a sense of possibility about them. (You can see I got a highlighter pen out, at some stage, and marked a couple of them in green.) There seemed to be some music in them. Also some emotion. 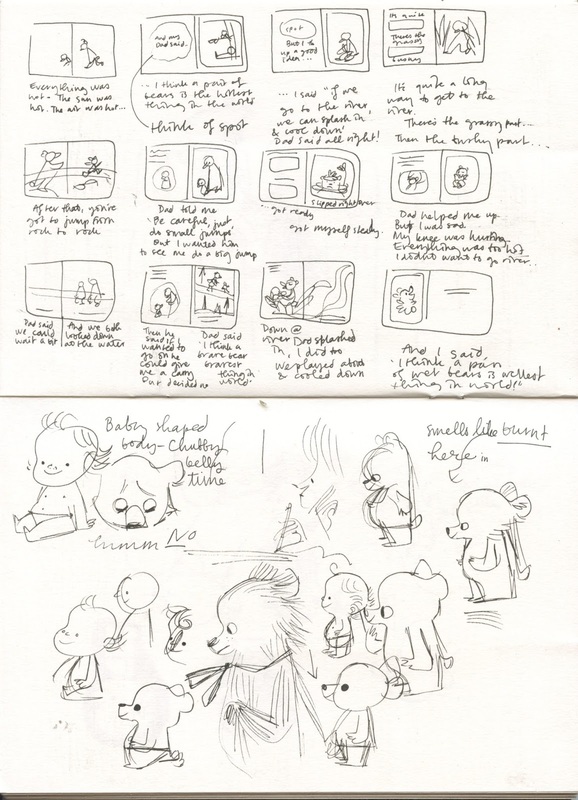 So I wrote PIC BOOK on the scrap of paper and I kept it in a file of possible picture book starting ideas. The final text was not far off, once I’d got to this stage. 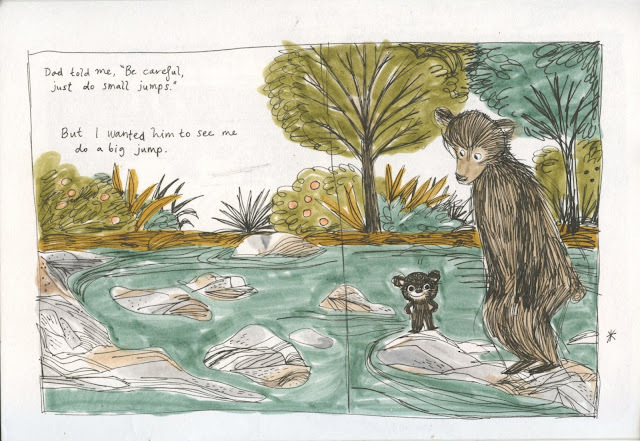 It’s a simple story in which those original phrases, with their music and emotion, bounce backwards and forwards between a father bear and his son. My hope was that in the multiple echoings of the lines, the music and emotion would also multiply. Have a read of the book. Does it do what I hoped it would? I’ll be happy if you think it does. When I initially read A Brave Bear I didn’t know if I would be knowledgeable enough to illustrate such an intimate text. I did, however, remember how it felt to be a child and how hard I tried to impress my Father and win his trust and approval. 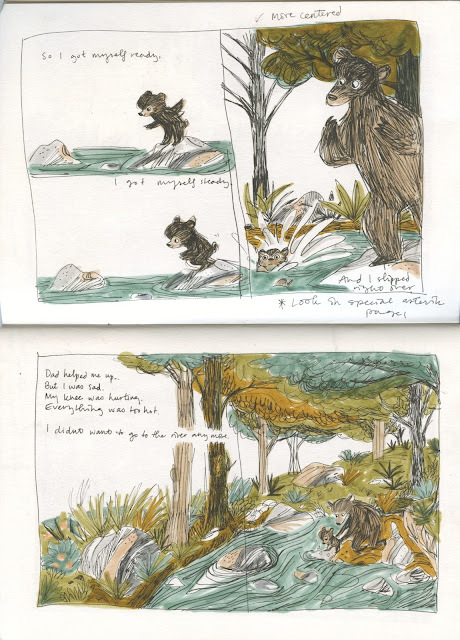 After deciding to illustrate A Brave Bear, I watched children talking to their Dads on the bus and parents nervously peering as their kid scooter-ed too close to the road. These were glimpses of a child feeling brave on their own, and a parent feeling brave in letting go. It is an oftentimes misread communication of love, and I was daunted in how to illustrate such a soft and subtle expression. This was the first time I illustrated a story that wasn’t my own, and I wanted to make it something Sean and I could both be happy with. I didn’t know beforehand, but a lot of times authors and illustrators don’t talk to each other; this makes the communication easier (sounds strange, I know) and the job a bit more concise. The art director and editor made a huge bridge between us and offered sound advice. However, we still were able to listen to each other and in the end, Sean made a few extra lines to go at the end of the story to go with some extra images I had done, and I think he encapsulated that feel of glowing pride and togetherness perfectly. Because the text was clear and unfussy, I had a lot of liberties with adding my own sense of narrative. 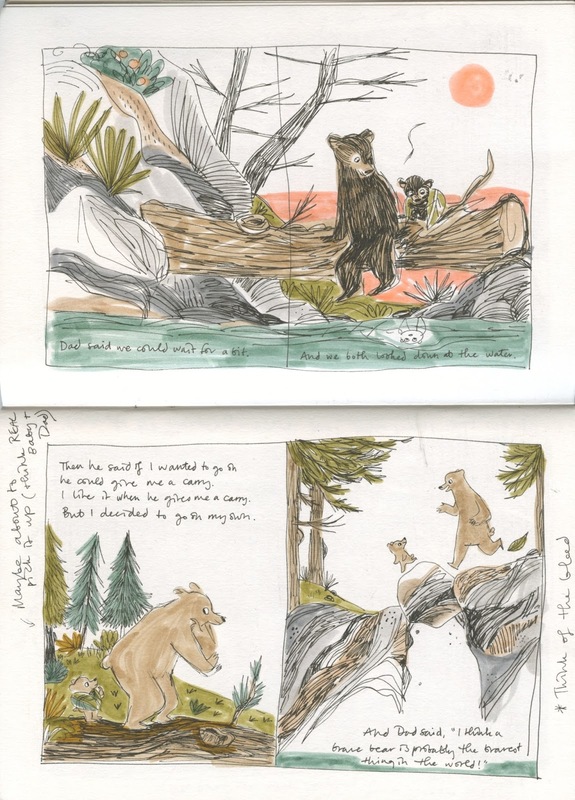 For instance, I tried to make a traceable map of where Dad bear and baby bear hike through, with landmarked log-bridges and sitting rocks. Just as a treat for the observant. There are a few hidden parents of other animals dotted around the pages, showing families in other settings. Doing these things make the work for me exciting, so I believe it to be a win-win situation! When I started illustrating this book (which was a while back now, two years ago!) we went through all sorts of character design changes. The step of figuring out a character takes the longest for me. I draw and redraw for a long time. A part of it is to get some muscle memory of their shape so they can look consistent. The character is important because we feel that we have to know who they are in order to love them. I think if they have some traits that are easy to find in others, or (especially) ourselves, we are more able to empathise. Baby bear is impulsive, positive, eager, and resilient. Dad bear is calm, quiet, non-disruptive, and supportive. We went through three drafts, two bear breed changes, a few dummy books, and two filled A4 sketchbooks, as well as one A3 one to get to the final outcome we have come out to! I hope the sacrifice of all those trees and pencil tips, the ‘undercover’ people-watching bus trips and the supreme patience of my art-director have amounted into some sort of warmth tied in with Sean Taylor’s writings. 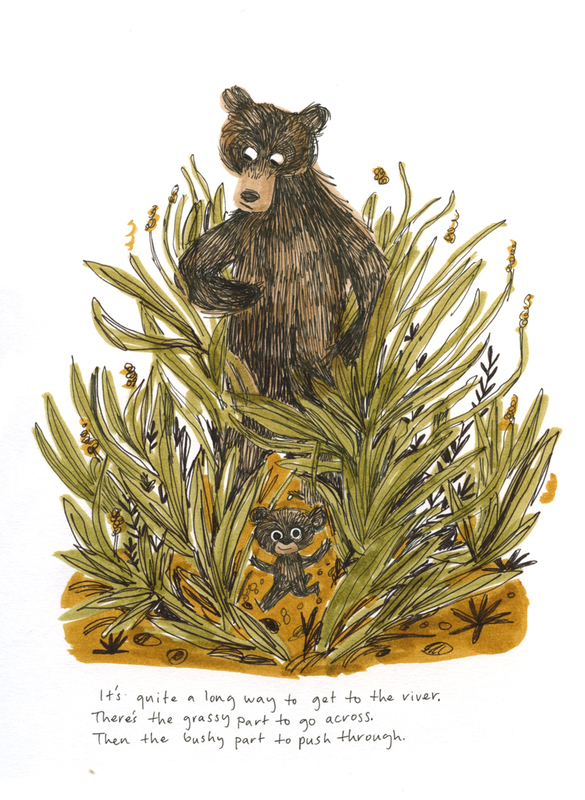 I hope you can relate to feeling as small as baby bear and as simultaneously all-powerful and all-powerless as Dad bear. It was a brilliant book to have the chance to help with, and I hope you will be able to see that too. A Brave Bear is out now. Pick up a copy at your local bookshop.